This photo of Ross Castle was taken from the edge of Lough Leane, in Killarney National Park. The castle was built by the Irish Chieftain O'Donoghue Mór in the 15th century as his stronghold. It would have originally been surrounded by a square bawn or defensive wall which would have included round corner towers on each end. According to local legend, O'Donoghue Mór jumped from a window of Ross Castle into the lake where he lives to this day in a state of hibernation in a magnificent palace under the waters of Lough Leane. Every seven years, on the 1st of May he awakes from his slumber and rises from the lake on his magnificent white horse to circle the lake. It is said that anyone lucky enough to catch a glimpse of him is can look forward to good fortune for the rest of their days. The front door to the castle is made of a double layer of thick Irish oak and is protected by a heavy iron grill or ‘Yett’. Between the front door and the Yett sits there is a Murder Hole (Poll na marbha) which sits above the entrance porch and allowed the castle defenders to throw rocks or pour hot liquids such as boiling oil or water onto the heads of any attackers who made it past the Yett. 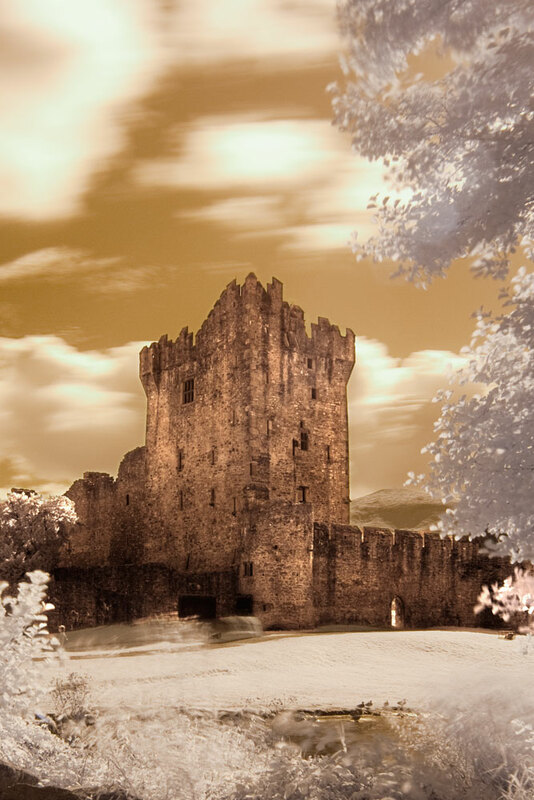 The Chieftain Mac Carty Mor took ownership of Ross Castle in 1580 and then leased it to Sir Valentine Browne. It was one of the last castles in Ireland to surrender to Oliver Cromwell's forces in the 17th century. An old Irish prophecy said that Ross Castle would never be captured until ‘a warship could swim on the lake’. So when General Ludlow marched on the castle with a force of 4,000 soldiers and sailed an artillery boat up the River Laune and into the lake the castle defenders despaired and soon surrendered. Ross Castle went on to become a military base before being acquired by the state in the 1970s and is now a major tourist attraction.